Who would have guessed that Jaba the Hutt had a son? George Lucas has the unique privilage of being able to pull whatever he wants out of thin air and it becomes instant Star Wars canon. And so he created The Clone Wars movie (and coming TV series) and Rota the Hutt was born. 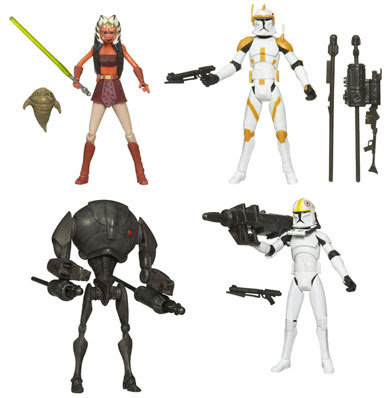 Now you can own Rota, the little green ball of stink, and his Jedi padawan protector Ahsoka in the coming Clone Wars action figure Wave 2. Mix in a couple more Clone Troopers (can we ever have enough Clone Troopers? Hasbro thinks not) and a boring Droid and you got the whole wave. These are of course tied into the new animated series STAR WARS: THE CLONE WARS, which premieres on Cartoon Network October 3, at 9 p.m. (ET, PT) with a special one-hour presentation that anchors the Network's all-new Friday night lineup. The movie wasn't horrible, but I can't escape the feeling that Star Wars is becoming oversaturated -- and that perhaps having it go away for a year or three would help it from becoming a mockery of what it once was. But it was Hasbro's #2 money-maker last year (behind only the Transformers, which did especially well because of the movie) and since Star Wars still sells so well, I highly doubt Hasbro has any plans for it but more Clone Troopers, repaints of older figures/vehicles, and more Clone Troopers (yes, I meant to say that twice). But at least we got the Big Millennium Falcon out of it. "George Lucas has the unique privilage of being able to pull whatever he wants out of thin air and it becomes instant Star Wars canon."